Shop Cerwin-Vega INT118sV2 Intense 18" 450 Watt Passive Subwoofer from AMS with 0% Interest Payment Plans and Free Shipping. The Intense series from Cerwin-Vega has established a well-deserved reputation for providing extraordinary and impactful sound at an affordable price. How do you enhance a leading product in its class? Improve the product components, sound quality AND lower the price! 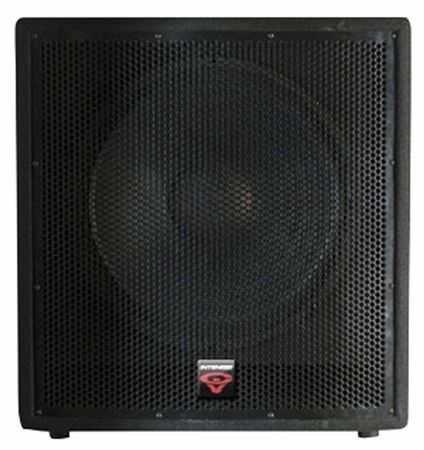 The Cerwin Vega INT118S V2 Passive Subwoofer is a high powered cab which is the perfect choice for live sound, program playback, and DJ systems as well as installation. What's New for V2 Intense Series? Improved dependability from a new positive temperature coefficient (PTC) thermistor that protects the tweeter. This component acts as a self-repairing fuse allowing the speaker to return to normal operation once the input fault is corrected. I love this speaker, the sound is awesome. It is a great addition to my sound system. I love to order from AMS they have quality products. The product is good it was the shipping that was not so good on this particular item. I needed it for a job on the Saturday that it was due but it never arrived because it was delivered to an old address. I lost the job for that weekend due to not having the product. Piss off your neighbors or Rock it at Night Clubs. Made extra strong where needed to hold in that Thunderous Bass. I wouldn't change a thing. It is heavy because of the extra large magnet etc. so make sure you have a good back or a dolly. Just plug in and play. Takes the 1/4in jacks so if you want to use at home you will need to splice one end of the cord or find one online already spliced on one side to hook up to your Home Amp/Tuner. Overall very good. Rocks the place. This is a strong, great sounding Sub that will get you evicted from your place or Rock the House at a nice size Night Club.